HCI Principal Pamela S Perkins will soon release Communication: The Performance of Life. Stay tuned for more infomation about this and other HCI publications. Affiliates representing a significant percent of San Diego County Professionals. recruiting and retaining the best qualified, talented employees of African descent. Introducing Communication as a field of knowledge where skills can be enhanced and developed to promote better Personal, Interpersonal and Group Communication experiences. Providing a practical model that helps participants understand all the elements necessary to effectively communicate with others personally and professionally. Designing and facilitating clinics to best suit your individual and group needs. Effective communication practices are learned. Communication is a science. HCI will introduce to you the pragmatics of Communication and make clear the direct correlation between personal, interpersonal and group communication practices. This covers EVERY aspect of your communication day. 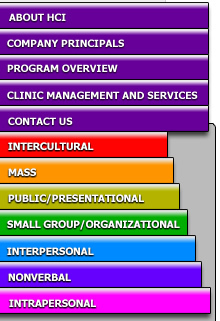 The Communication Staircase presents our daily communication experiences as they occur in all settings. We move in and out of one communication context to the next, often clueless of the communication rules governing each setting. HCI takes the participant through the process of how to manage communication rules within different communication settings. The Communication Staircase is analogous of the process of walking up a flight of stairs. Just as you take a flight of stairs one step at a time to ensure arriving at your destination in one piece, so too does the Communication Staircase help you ascend the daily steps of how communication operates in your life, step-by-step. With each landing you gain greater confidence within the Communication environments you must function effectively within. HCI is about getting you to see communication as an important and real solution to problem solving. It is the awareness of how these settings relate and interact with one another that empowers the communicator. Success at the top of the pinnacle starts with success at its foundation. Allow the Human Communication Institute to walk with you and your staff up the ladder of communication success one step at a time! Climb the Staircase! As a full-service Human Communication Management Consulting Firm, we attend to all areas of personal, relationship and group communication practices by offering support in all the following Communication Practices. Click to browse clinics in alphabetical order, grouped by communication area, or view youth clinics. Self-assurance training – KNOW All You Can Be! Self Love = Health Love! The Professional Image: What Are You Selling? Children and teenagers are just little humans in a miniature version of the world. As such, they also experience the varied communication experiences adults do; just through a different lens. They too are concerned about popularity, making the grade, fitting in, the right clothes, and beauty and weight issues. HCI offers the Communication Staircase Program in a 7-week intensive series of workshops and projects designed to equip each participant with positive self and life-affirming goals. From the earliest possible intervention, the Youth Self-Image Project works to help young people gain the characteristics essential to personal achievement and civic responsibility as well as understand the correlation between these two endeavors. How To Be truly popular! How Your Nonverbal Communication Can Make You a Winner and Popular! To Be Influenced or Not to Be Influenced, That is the Question.